The wild blackberries were more plentiful and luscious than any other patch I had ever seen. Later on, in the early fall, the Concord grapes were just as abundant but never did attain the delectable quality of the blackberries. No doubt, years of neglect and absent pruning suppressed the quality of the purple fruit. Still, this place was the Garden of Eden for this ten-year-old. In my youth I regarded my secret patch as a clandestine discovery known only to me. The thorny canes and old vines had few visitors due to the their concealed location behind an old cemetery maintained by a local church in town. A fork in the barely visible trail further marked their location to me, but others might not even be aware of the path. With so few visitors, there was always plenty for a youngster to have more than his fill during harvest times. I rarely collected the fruits in a pot or pail. Preferring a pick and a pop directly into my mouth, seemed the best way to go. Rinsing the pickings with water never crossed my mind. Stained fingers, lips and tongue further verified just how delicious those fruits were. Black seeds, lodged between my teeth, often remained there all day, until I brushed before bedtime in the evening. A few years later, when Dad thought I was mature enough to carry a gun alone, I hunted in the same area. It was then, with most of the vegetation dead and lying close to the ground from the effects of frost and snow, that I observed that there was more to this area than just berries and grapes. It was odd that it took me years to realize that the rocks and large stones behind the berry bushes could not have accumulated there, naturally. They had to have been placed in that fashion on purpose, no doubt serving as an old foundation for a home or barn. Further visits revealed parts of old wooden beams, window fragments, broken bottles and some badly rusted nails. A fractured crock pot and pieces of a two-toned jug surfaced too, after kicking down some of the old stones using my hunting boots. Odd too, that none of these discoveries interested me in the slightest at that time. I was more than content to hunt, to walk in the woods and to just enjoy the opportunity to bag some game. Approximately 20 years later, my dad and I gathered a few quarts of blackberries in that same area of the old foundation. This time my mom wanted enough berries to bake some pies and Dad and I were quick to oblige her and her request. In addition, I couldn't pass up the opportunity to visit the patch and foundation again. I was now in my mid-thirties and married, with three children. I did not venture behind the thorny bushes to the foundation but I found that I was more intrigued with its existence than I was during prior visits. While picking berries and chatting with Dad, I could not help but think about the inhabitants that lived in that location, perhaps over 150 years earlier. Who were they? How did they make a living? How did they cope with illness, adversity, and the cold winters? As I was deliberating deeply the lives of these unknown residents, I was even more fascinated with something I suddenly noticed about myself. Why had my interest in this area changed with the passage of time? My thoughts quickly changed again and the idea of consuming one of Mom's homemade blackberry pies soon took over my thought processes. With our buckets filled, Dad and I continued to chat as we headed home with our bounty. It's been nearly 30 years since my dad and I gathered those berries. Today, I can't recall the actual time we ate Mom's pies or what all my dad and I talked about that day. I don't remember the humidity level, the temperature, or what day of the week it was either. What does still stick with me, however, are the thoughts of that stone foundation and the people that once lived there. I've come to realize that the old foundation was more than just stone and mortar. 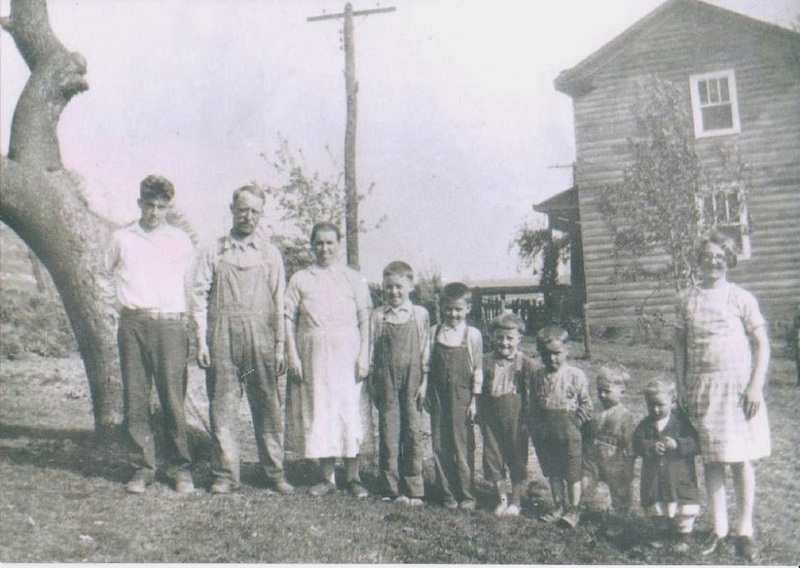 Those early settlers no doubt had dreams and aspirations of raising a family. They wanted to provide a good life for their children and grandchildren. In all probability; good health, happiness and religion played important parts in their lives too. A foundation of intangibles was just as important to them as the stones that served as the base of their home or barn. In the larger scheme of life, the imagery for those inhabitants, was no different than it was for my dad and his generation, and for those contemporaries of my life as well. You see, my dad built his own home, and with the help of family and friends, I pieced together our home too. Not only did we set the foundation in block and mortar (more recent substitutes for stone); we also attempted to provide a contrasting, less tactile kind of base for our children and grandchildren too. The key ingredients and makeup of this abstract foundation included components such as family values, beliefs, hopes and love for each other. When you analyze and compare the ideals and goals of families long ago to a family's dreams today, we might realize there's not much of a difference at all. Not only are the tangible and concrete foundations similar in purpose, but the intangible key stones are analogous as well. Perhaps, some day, 150 to 200 years from now or more, someone might discover my dad's house footer or my present home's foundation. Maybe that person will reflect on the fact that there's much more to a home than just a concrete base. Might that individual also realize that the hopes and dreams for his or her descendants are no different than the aspirations I have here in my home, or those dreams my dad had for his home and family. And may future inhabitants recognize the fact that our dreams, goals, and inspirational foundations in life are here to stay. They remain with all of us and our descendants, well beyond the time when stone, mortar and concrete begin to crumble. Author's Note: This coming summer, God willing, and if my failing knees allow; I intend to visit that fork in the trail behind the cemetery where that old stone foundation remains in part. If by chance, I can't locate it, rest assured, I will still believe that intangible foundations will continue on. And that they will be passed on again to each following generation through time.